Wandered into this pub by accident, as it's not in the main part of the city, and it was very pleasant. Had a couple of Harveys, which was in good form, although the barmaid seemed a bit of a novice at pulling beer through a handpump.. Seems that it's only been open for 3 weeks, under new ownership, and it was very clean and bright. Had a meal in there, which was very good. Wow, this is a hidden gem. Stumbled upon this pub over the weekend. Ben the new landlord has spent a fortune on the refurb and it certainly shows. The decor is stylish and very comfortable, plus with an outside courtyard it was a real sun trap over the weekend. We tried their speciality burgers and were very impressed plus they had a great range of beers and a good wine list, prices seemed very reasonable. Just wish this was closer to our home but next time we are in Canterbury we will certainly visit! Lovely and highly recommended!! Wow or what ! This has been refurbed i cant believe it, 3 ales on just had black sheep was great. 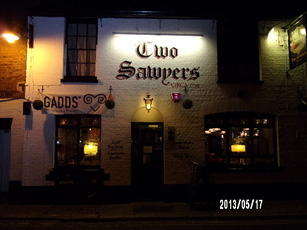 Really smart pub in such short space of time, contemporary yet traditional.. food looked good too. New owners to boot.